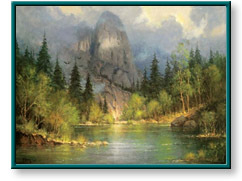 Yosemite's Sentinel and other artwork by artist G. Harvey can be viewed in our artist slideshow. Yosemite's Sentinel by artist G. Harvey and other Gerald Harvey art, art work, artwork, canvases, giclees, images, limited editions, open editions, paintings, paper, pictures, posters, and prints can all be found at Christ-Centered Art. Yosemite's Sentinel depicts Yosemite's Sentinel Dome which is the second highest point in the main Yosemite Valley. Image Size 16.5" x 22"
This unframed limited edition canvas print comes mint in its original packaging, is unstretched, has a genuine certificate of authenticity from Focus on the Family, and is individually numbered and hand signed by the artist G. Harvey. This unframed limited edition paper print comes mint in its original folio, includes a genuine certificate of authenticity from Somerset Fine Art, and is individually numbered and hand signed by the artist G. Harvey. Yosemite's Sentinel by artist G. Harvey as well as other open and limited edition cityscape, Civil War, Focus on the Family, oil industry, rural, and western paper art prints and canvases, giclees, images, lithographs, paintings, pictures, posters, and reproductions by renowned Somerset Fine Art and Somerset House Publishing artist G. Harvey can be viewed and purchased at special sale prices at Christ-Centered Art.